If you are looking for a perfect business opportunity that will provide profitable results in Kansas, the BBQ and grill cleaning business is one to consider in your list. The BBQ Cleaner can help you grow your business in the state. We will not require huge investment nor will we require you to have many years of experience to be able to start this business. All you need is perseverance to be able to reach out to more customers in the state. We are not a franchise business. We will never require you to pay monthly or annual royalty fees like franchise businesses do. We know that you can potentially grow the BBQ and grill cleaning business in Kansas because we have been receiving service requests from residents in the state. Our problem was we cannot reach out to all of these homes. With your help, we will be able to extend high quality grill cleaning services to residents of Kansas. You can work at your own pace and charge service rates accordingly. The BBQ Cleaner will help you grow your business successfully. Why Start a BBQ Cleaning Business in Kansas? Weather is in Your Favor: Summers in Kansas are very hot and winters can be very dry and windy. Residents of Kansas love these weathers and spend time grilling outdoors whenever they have the chance. It will be easy for you to offer grill cleaning services to residents. Large Customer Base: In Kansas City alone, there is a Barbecue Society which holds BBQ activities. Apart from this growing number of potential customers, there are also other homes in Kansas which have their own grills. Competition is Rare: There are many business opportunities out there which have already established themselves but are within highly competitive niches. The BBQ and grill cleaning services is a great way to grow a business with lesser competitors in Kansas. Grow Your Business When You Are Ready: We will not require you to hire more people. You will be the one to decide whether or not it is time to hire more staff and add more vehicles to grow your business operations. How Does The BBQ Cleaner Help You Get Started in Kansas? Our all-in-one package is indeed a great way to start your BBQ and grill cleaning business. Together with this, you will also have access to on-going lifetime business support from THE BBQ Cleaner. Since our inception in 2009, we have grown our business nationwide with over 180 operators to date. We are a global leader in the BBQ and grill cleaning industry, thus with The BBQ Cleaner, you are sure that you will reach your full earning potential. 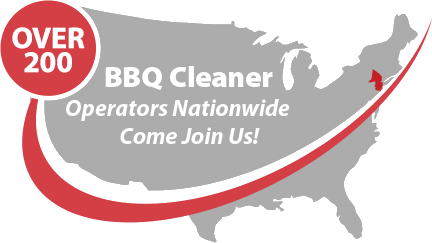 Talk to us today to find out more about this stellar BBQ cleaning business opportunity in Kansas!